"Last year, we could not even spell robot," says Dave Perkowski, General Manager at All Axis Machining. 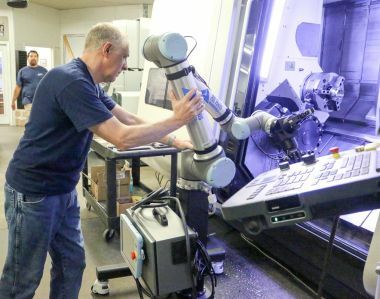 He walks the shop floor where numerous collaborative robots are now hard at work automating CNC machine-tending, sanding, deburring, part inspection, laser marking and wire EDM. "We had no actual robotic integration and automation. Being able to immediately start interfacing cobots with our machines has been unbelievable." Five months, five cobot installations -- that was the timeline at All Axis Machining. They now automate CNC machine-tending, sanding, deburring, part inspection, laser marking and wire EDM with the UR10 collaborative robots from Universal robots. All Axis started to look for automation as they faced a lack of available manual labor, causing unwanted machinery downtime. "It drove me pretty crazy when all the guys were out to lunch, and none of the machines were working," says Gary Kuzmin, owner of All Axis Machining. "After 5pm, we'd have a skeleton shift with only half the machines running. It was costing me orders that I couldn't get to my customers on time." A major obstacle in automating operations was the fact that All Axis' machines were legacy equipment with no direct interface for traditional industrial robots. "Also, an industrial robot requires a fence around it, we weren't ready to give up floor space -- or more importantly; be locked into using the robot for one task only," explains Kuzmin. 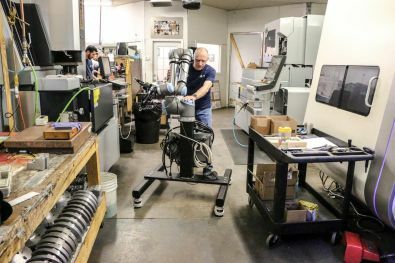 Having exhausted their options with conventional robotics, the Texas machine shop discovered collaborative robots could be a possible solution. 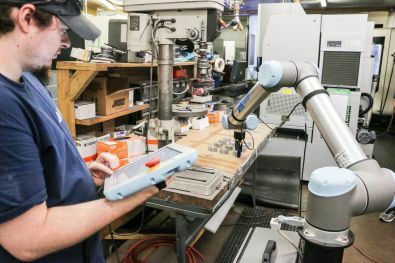 "We got a demo from Universal Robots and quickly realized that these cobots offered easy integration through the controllers of our old machines," recounts the machine shop owner. "We had all this legacy equipment in our shop," says owner of All Axis Machining, Gary Kuzmin (right). "Machines that were five, six, seven years old. Back then, automation was often not even available for this equipment," he says. "The UR+ software integration has allowed us to take all these applications and turn them into a turnkey system automated by cobots that we can deploy to other machine shops too." The communication between the UR cobots and All Axis' machines is made possible through theUR+ platform, that through a free Software Development Kit (SDK) allows users to develop their own plug-ins, so-called URCaps, that integrates the control of the entire application right through the cobot's own teach pendant. "Universal Robots has done a fantastic job of making this solution available to shops like ours," says Perkowski. "The operating system is open, I'm not locked into a proprietary environment. We're basically given this cookbook with an easy way to expand communication," he says and explains that All Axis uses protocols such as TCP/IP, Ethernet, Modbus and Profinet connecting cobots and machines. "From a technology perspective it's heaven to have all these capabilities and take our current systems and integrate without any other assistance," says the general manager, adding there are no hidden costs. "An advantage is we don't have to pay special license agreements, it all comes with the purchase of the UR cobot. We simply sign up on the UR website to become a developer, and we download the elements we need." The UR cobots enable All Axis Machining to run lights-out operation, increasing spindle up-time from eight to 20 hours a day. 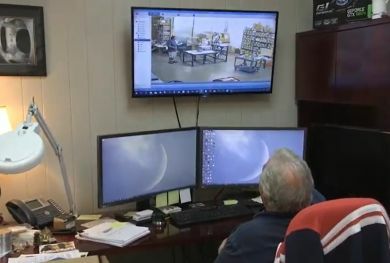 "We have cameras throughout the facility, so I can sit at home 80 miles away and see the robots working with nobody around the machine," says owner of All Axis Machining, Gary Kuzmin. "That's really a sight to behold." The UR+ platform also addresses the trial and error that associated with equipping the robot arm with peripherals such as end-effectors, force sensors, vision cameras and other accessories. The platform features a showroom with more than 100 products certified to work seamlessly with Universal Robots. "We were able to browse the showroom and quickly bring UR+ grippers and tool changers off the shelf and onto the cobots," says Kuzmin. As with any machine shop owner, he is always worried about the bottom line. 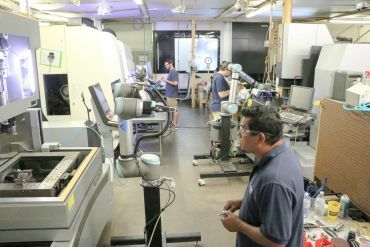 When All Axis got its firstUR10 cobot, the company had a job slated to take four to five months of run-time on one machine with the current staffing. "We couldn't hire any additional staff at that point, so we took the robot, put it on the CNC machine and actually delivered that part almost two and a half months early because of all the additional machine time that we had," recounts Kuzmin. "We saw a 60 percent profit increase on that job alone. ROI was about a four month return. Our spindle up-time has gone from about eight hours a day to about 20 effective hours." All Axis developed a 7-axis pedestal stand for the UR10 cobots so they can easily be moved between different tasks on the shop floor. All Axis also soon discovered that the 50 microns accuracy of the UR10 was crucial in terms of precise insertion in laser marking and CNC's as well as in sanding and deburring. "Our sanding used to be all manual and lines from tool marks could not always be avoided," says Kuzmin. "With the UR10 that part came out perfectly straight; in fact, the customer called us up and said they were impressed and wanting to know what we did different." When the machine shop first researched the cobots, management was curious to find out how different the programming and operation would be, specifically for operators with no prior experience. The company had the employees go through theUR Academy, consisting of free, interactive online modules that teach basic programming and set-up. Having exhausted their options with conventional robotics, the Texas machine shop discovered cobots offered easy integration through the controllers of their old machines. "We had an elderly operator doing the sanding, which requires a lot of muscle," explains Kuzmin. One day he was watching the operator on a monitor and saw the operator pick up the cobot's teach pendant to start programming it to sand the part. "I've never been prouder to see one of our employees learn a brand-new technology. This is really empowering and is going to improve his whole lifestyle and earning capability as well," says the shop owner. All Axis is not a high-volume shop. The company typically runs more than 20 different parts per day and needed quick change-overs; both between tools at the end of the robot arm and in terms of moving the robot between machines to be tended. "We need to achieve change-overs in about 5-10 minutes at the most. The UR+ program allowed us to find products for the robot that all had quick disconnects. The platform even gave us the tools to create some ourselves," says Perkowski, adding that All Axis has also developed mobile platforms that now wheel the cobots between jobs. Half a year into the cobot automation project, All Axis management realized their newfound expertise could easily be extended to other machine shops facing the same hurdles. The UR+ platform also addresses the trial and error that associated with equipping the robot arm with peripherals such as end-effectors, force sensors, vision cameras and other accessories. 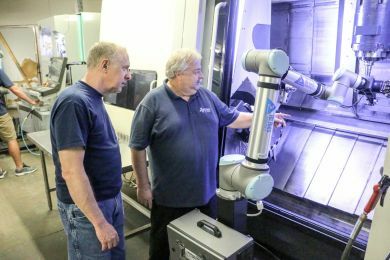 "We suddenly saw a whole new business emerging," says Kuzmin who created a new company, All Axis Robotics, dedicated to the integration of turnkey UR cobot solutions in the metal fabrication industry. "When a company calls us now, we can come in, look and evaluate what their needs are, and on any of their equipment -- no matter how old it might be -- we can probably implement a robot into their operations," says the shop owner, adding that people might wonder why he would be helping out the competition. "What we compete for is labor. There's plenty of business out there for all of us to have," he says. "Integrating cobots into legacy machines is what will really drive manufacturing in the United States."